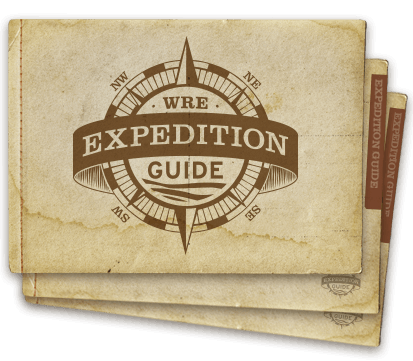 Although Western River Expeditions' guided rafting trips are not sold as "fishing trips," many guests find opportunities to fish while in camp during the evenings and early in the morning. If you plan on fishing, note that your pole must be collapsible, in a case, and clearly marked with identification. Western does not provide fishing gear. Quality of fishing often depends on water conditions. 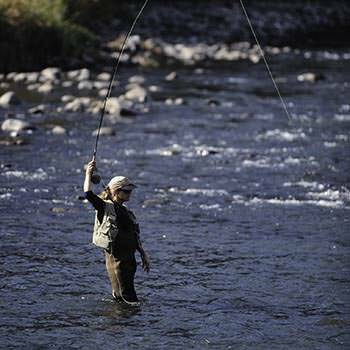 At times, the river may be silty due to rain runoff, in which case fishing may be unsuccessful. If you have chosen to fish during the course of our 5-day Desolation and Gray Canyons trip you will primarily find time in camp. About 99 percent of the fish here are exotic species, predominantly carp, catfish, sand shiners, red shiners and fathead minnows. You will need a valid Utah Fishing License. 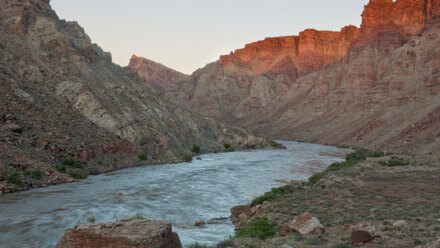 If you wish to fish on a Colorado River trip in Utah, we recommend our 4-day Cataract Canyon trip. About 99 percent of the fish here are exotic species, predominantly carp, catfish, sand shiners, red shiners and fathead minnows. 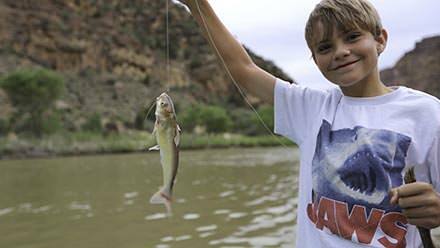 While no special use permit is required to fish in Canyonlands National Park, visitors must have a valid Utah State fishing license and must comply with all state fishing regulations. NOTE: On both our two-day Cataract Canyon trip or one-day Westwater Canyon trip, you will not find time to fish. Rainbow trout, brook trout, and cutthroat trout are plentiful in the Colorado River, especially when the water is running clear and cold. You will mostly find time for angling in camp. Take note of the endangered native species mentioned below. You will need a valid Arizona Fishing License. 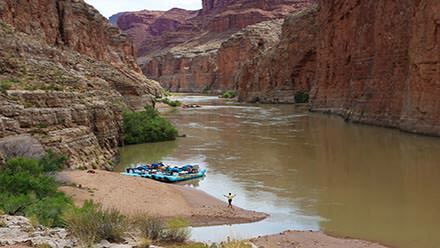 Resource development, competition with non-native species and a variety of other factors contribute to native fish populations' struggle to survive and re-populate in the Upper Colorado River Basin. 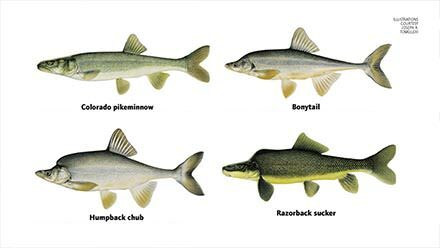 Colorado squaw fish, razorback sucker, humpback and bonytail chub are endangered and may be found. Visitors (on Green & Colorado River Trips) should become familiar with these endangered fish and the proper techniques for releasing them unharmed, if you are unable to identify a fish, please release it back into the water alive. 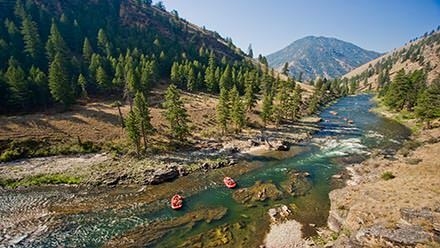 Every angler 14 years old or older must have a valid license to fish in Idaho. Nonresident anglers under 14 may fish without a license if accompanied by a license holding adult. Purchase licenses at any local license vendor, Fish and Game office, via telephone or through Fish and Game’s website. For complete fishing regulations, please contact the Department of Fish and Game at (208) 334-3700. 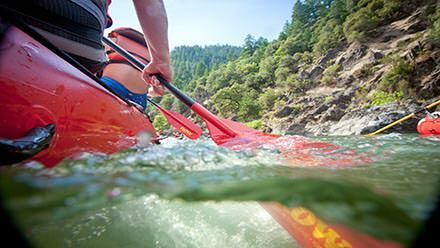 Famous for its chinook salmon and steelhead fishing and white water rafting, the Rogue River flows about 215 miles from the Cascades to the Pacific Ocean at Gold Beach.